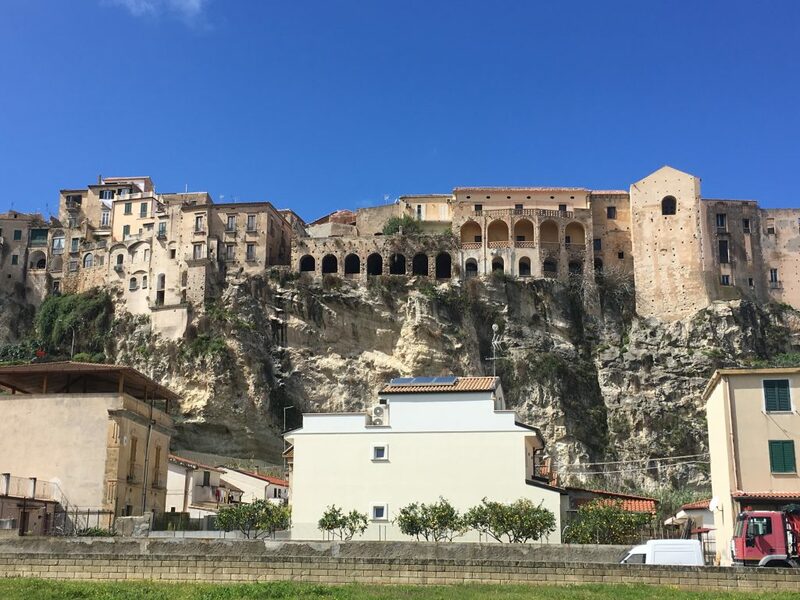 As we drove into Tropea, passing a number of vegetable selling stalls on the side of the road, I finally remembered why I recognised the name. We had recently watched the Hairy Bikers Mediterranean Adventures and in the first episode they had featured the ‘famous’ Tropea onion. It may be famous in Italy but I hadn’t heard of it until watching the programme, of course now we were here I had to try some. The red skinned onions are sweet and mild with very little of the acridity of the cooking onions that we might buy in the supermarket. Given that the taste of uncooked onion can linger in my mouth for 24 hours they were the ideal salad onion for me. 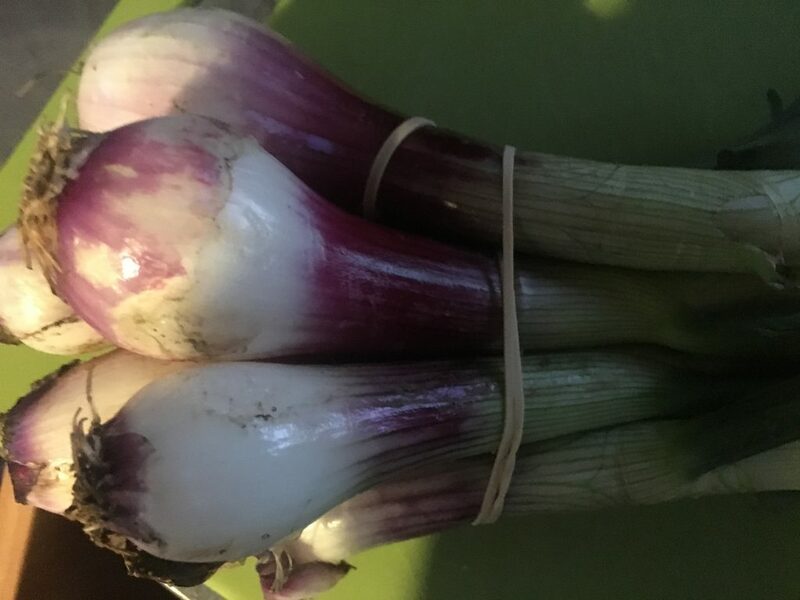 The onions are sold all year round in various guises, right now the onions on sale are slim, with very little bulb and can be eaten raw in salads like a spring onion as well as being cooked. We particularly like it in a stir fry although I imagine Italians would think that was sacrilege. 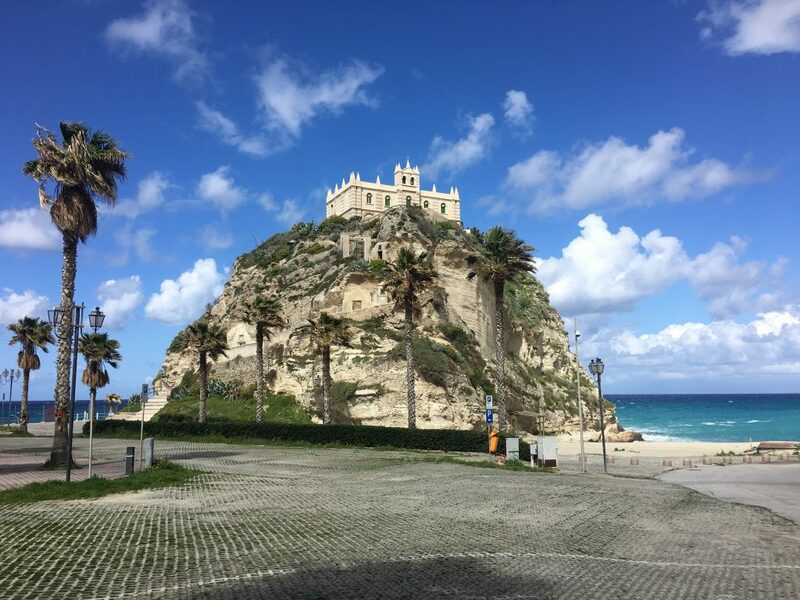 Tropea is an attractive town set on top of a cliff with an area of seafront below the cliff where we found a few carparks to choose from. At the moment the parking is free, with the parking meters removed from the car parks. Our sat nav had fun on our journey into Tropea as it tried to entice us into a dive onto a road 5 meters below, but we managed to find a route we were actually capable of and work our way down to the one way system on the seafront. Getting out was equally tricky, as the route south goes under an impassably low bridge (there are signs saying no motorhomes and vans, so it’s worth paying attention to them, guess who didn’t!). You have to head out north, AND the road was closed AND there is a ZTL! In retrospect it would have been easier to go the wrong way back along the seafront, we had seen a number of people doing this but thought that we would be good for a change. Once in the carpark we were accosted by a ‘fisherman’ who wanted to sell us some fish. At €10 euros a kilo it wasn’t bad value, but they were small fish that would definitely not meet any regs for minimum size. 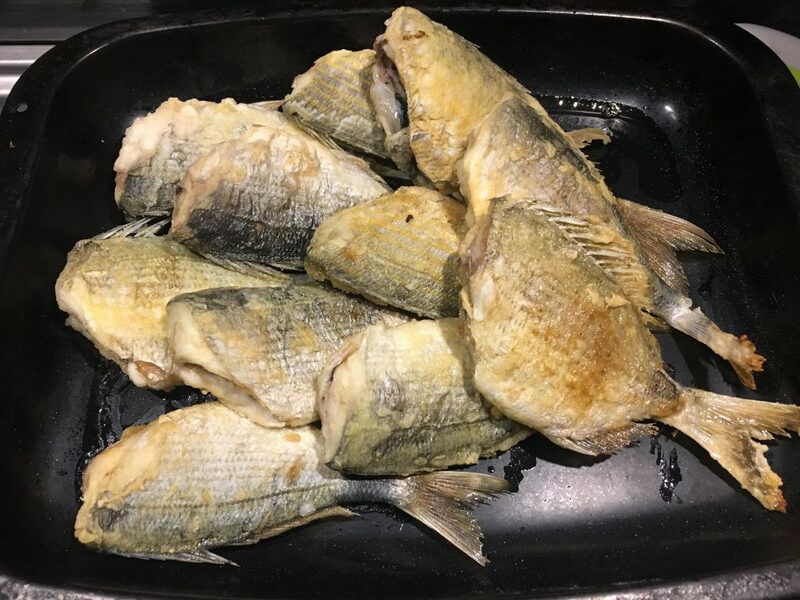 Nevertheless we decided to buy some for dinner, after all they were dead already. Then he then tried to double the price. For some reason being ripped off always makes me feel embarrassed, I blame it on my Britishness. My only defence is what Paul calls my ‘Paddington stare’, I think it makes the recipient think I’m a little simple. Anyway I handed over the previously agreed €10 with a bland look and he wandered off without any further attempt to inveigle more money from us. 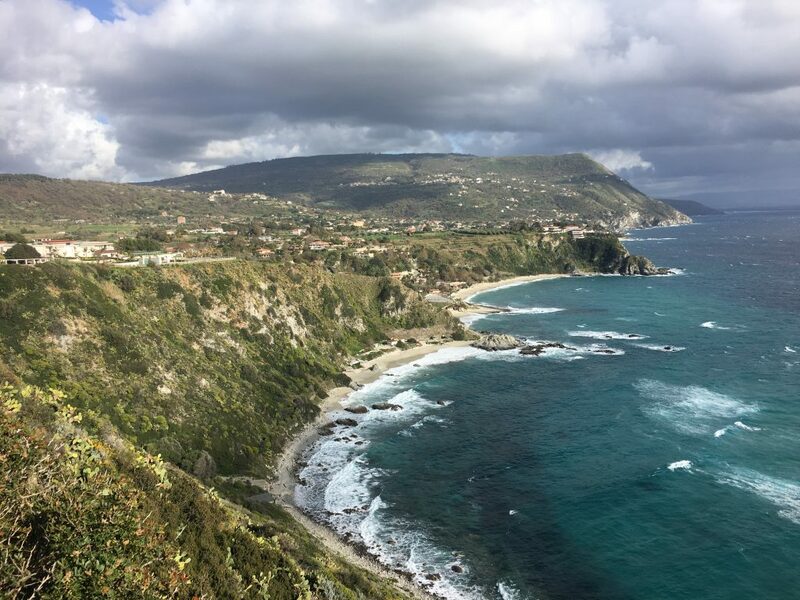 We cycled from Tropea to Capo Vaticano, following the smaller roads where we could (a lot of them were dead ends) past endless fields of onions in the red soil. The smell of onion was always faintly in the air, especially where they were being harvested. There were views out to Stromboli and the Aeolian Islands, a little hazy but we could just about make them out. It bought back memories of our trip to Stromboli a couple of years ago. If you ever get the opportunity then do go, it’s an amazing experience to sit and watch the firework display of a live volcano as the sun goes down. The day had started bright but breezy and the increasingly gusty winds drove us back from the headland and views of Cabo Vaticano to Bertie where we spent the evening watching the sky turn a dark purple, delivering thunder, lightening and hail. With a mixed forecast for the next few days we decided to head to a campsite to do some washing and chores.